Passion is the new buzzword that gets tossed around a lot these days: Follow your passion. Do what you love. Whether you make a career out of it or pursue it as a hobby, your passion should be something that adds positivity, enjoyment, and a sense of purpose to your life. The time you spend doing what you love should be worth it. So how do you discover your passion? More often than not, your passion is usually right there in front of you, but you just tend to ignore it. With crammed schedules, emotional baggage and cluttered spaces, it is often easy to get bogged down by day-to-day priorities and practical implications instead of following your heart. Many times, even if you know what your passion is, you may not be ready to accept it or are afraid of giving it a try. Other times, it’s the endless chatter in your mind that lets you talk yourself out of whatever your heart is yearning for. You need to boost your self-esteem and self-confidence to follow your passion. Following your passion doesn’t mean you have to quit your job. Your passion can be a hobby, something that gives you relief from your daily grind and helps you relax. Here are some tips to help you find your passion in life. It will be well worth the effort. Spend some time in a quiet place. 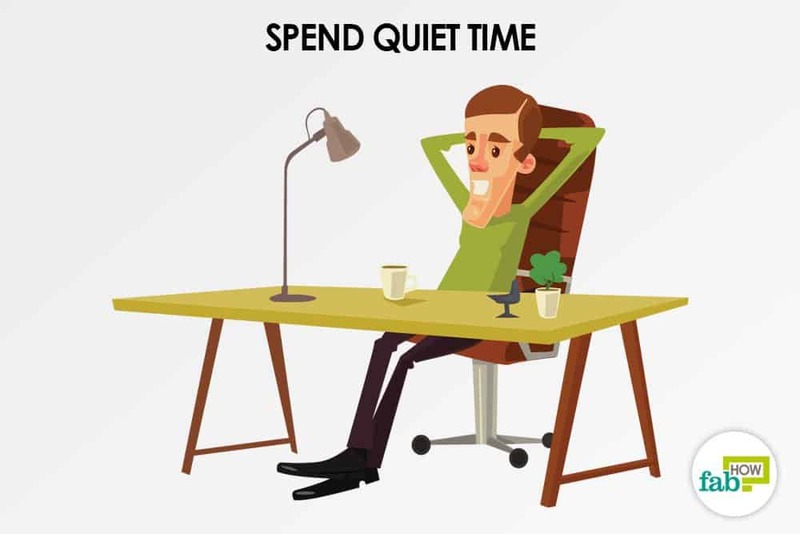 Meditation or simply spending some time in a quiet room will help cut out the noise and clutter in your mind. The peace will better allow you to ask questions and find their answers. 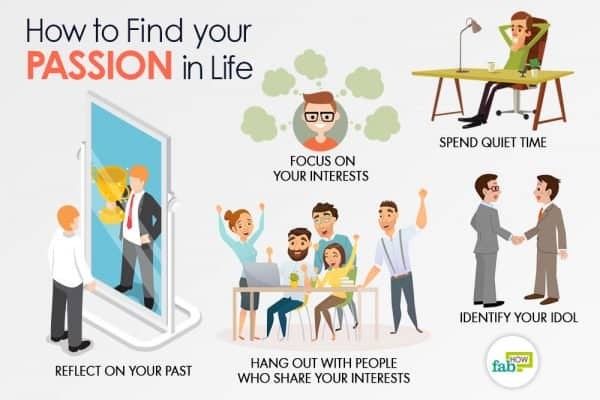 This way you can find your passion in life. 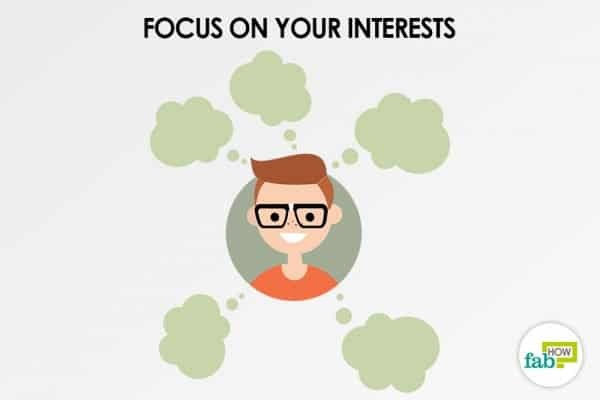 Pick five interests and focus on them. Take time to focus on your top five interests. Focus on each interest in great detail. Pay attention to the level of excitement you feel when you think about the interests and make a list of practical attributes of each. It will become clear if the interest is something you can do yourself or enjoy when someone else does it. For example: If gourmet food is an interest, it may be the act of eating out that interests you and not the act of cooking the meal. Keep a close watch on things that make you lose track of time. Keep doing things that interest you, but start to notice which activities you enjoy more than others. Is there any activity that you get so engaged in that time seems to pass in the blink of an eye? 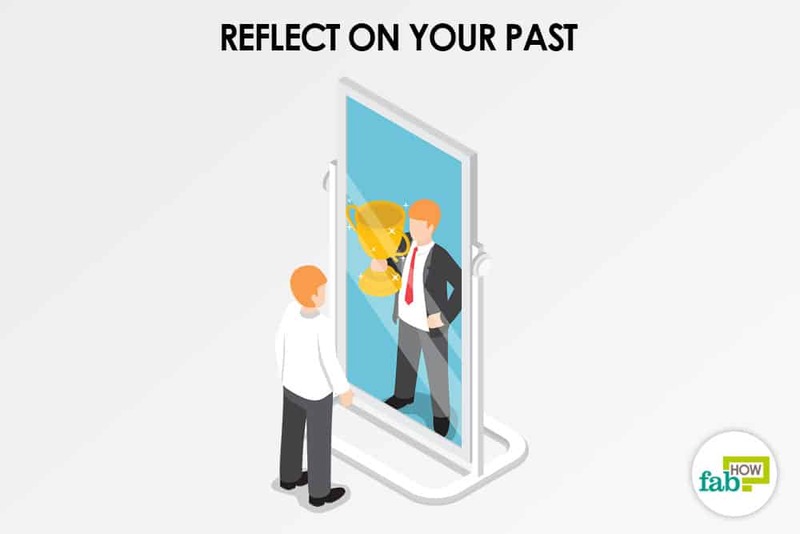 Reflect on your past. Set aside time every day to reflect on experiences and people who have affected you in the past. Make a list of major events in your past – places or environments visited, achievements and failures, and so on. Write down how they affected your life. Identify people who are where you want to be. Study people who are successful in your area of passion. Study what they do or have done to be successful. Contact people in those successful areas and ask if you can spend an afternoon learning from them or sharing ideas. Consider your common interests; things you do every day. A single skill does not define successful people. You are a fusion of skills. You can weave all your interests together and find something that you do uniquely well. For example; do you often read, exercise, attend spiritual retreats, or attend music events? Perhaps your passion could be in writing about your experiences or hosting a lecture. Look for things that can make you talk incessantly. What are some things that you could talk about for hours? Is it music, automobiles or politics? You may notice that after you’ve been talking about it for a while, you feel energetic and super-charged up. Find realistic things you would love doing if you could start your life or career all over again. If given a chance to rewind your life and start all over again, what would be your career choice or what are the activities that you would want to be associated with? The answer to this question will probably help you find your passion. Seek out things that you are ready to spend time learning more about. Whether it’s volunteering, part-time work, interning or mentoring, attending seminars and events, connecting with people in your area of passion – what is it that you wouldn’t mind spending your free time doing? Research each topic and dedicate some time for hands-on learning. What are the things that your family or friends know you for? Do people approach you for advice on gardening or health tips? Do people know you for your computer skills? Try to think of things that people rely on you for when they need help. We all have a set of unique skills. We use them daily without thinking about it. Chances are, your passion lays within a skill set you already use. Self-confidence will help you see the strengths that others already see. Be flexible with your interests. You do not always have to be logical when following your interests. Stay flexible and open in your approach. Go after what excites you, as you never know where your new interest might take you. Do not worry about the future, think of the present. “Why leave for tomorrow what you can do today.” Focus on the present and practice powerful self-talk for motivation. 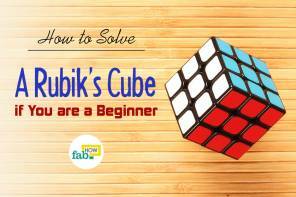 Plan on trying or learning something new each month. Pushing yourself outside your comfort zone will open up a world of new opportunity. 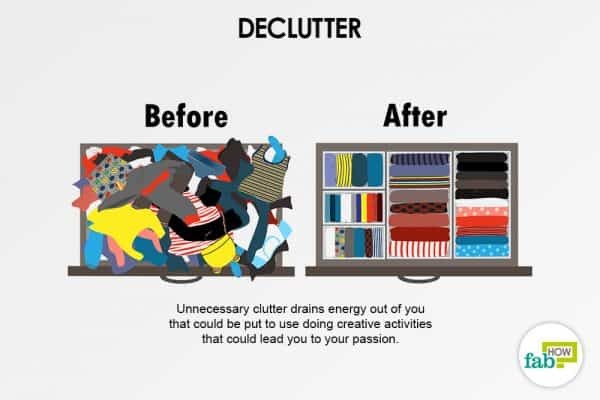 Declutter. 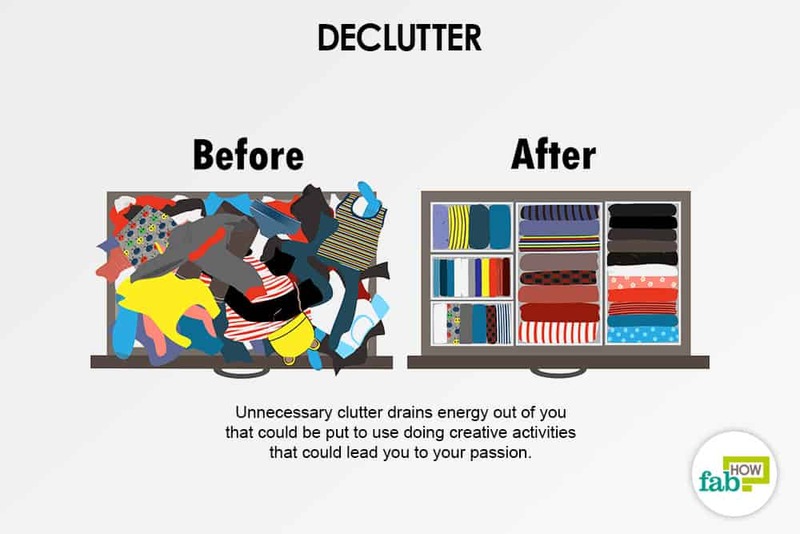 An overload of things and unnecessary clutter drains energy and makes simple tasks seem overwhelming. Throw away or donate items to charity that you no longer use. Prioritize the material things in your life. Living in an organized environment leads to a more organized mind. Make a creativity board. Get a large poster board and put quotes, sayings, poems, inspirational messages and images on it. Place it where you will see it every day. When you surround yourself with things that remind you of what you want to become, your passion grows. Do not contradict your principles and values. Know what your life principles and values are and what you cannot compromise. Avoid making decisions that contradict these values. If you love spending time with your kids, do not take on work that leaves you little time to be with your children. It will eventually make you unhappy and unsatisfied. Spend time with people who share your interests. Be around people engaged in your areas of interest. You’ll learn more about it from them. Join groups or attend classes about your interest. 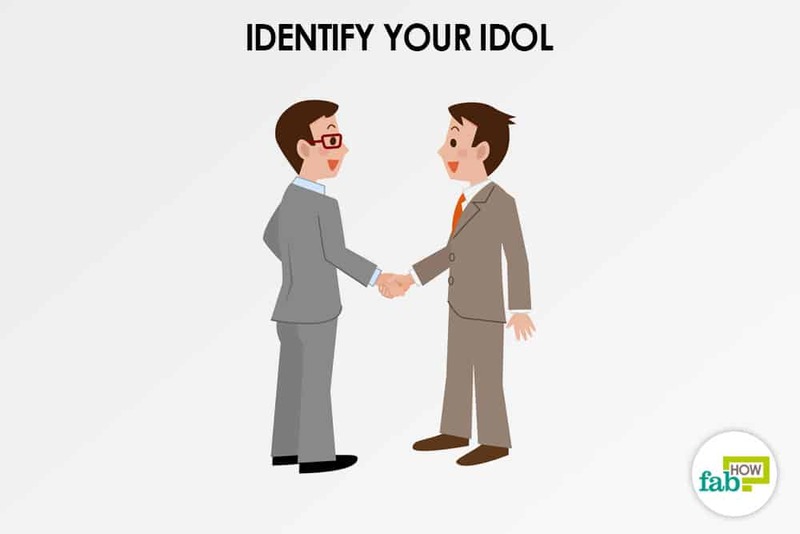 Social engagements revolving around your interests will stimulate your passion. Do not follow someone else’s dream. Do not do things because your parents, friends, or colleagues want you to. Set goals to help you reach your ideal self. Work to be someone who is happy, independent, and strong. Do what feels natural and inspires your passion. Build your dreams. Know that it will take time and money. Following your life’s passion may require you to make short-term sacrifices. You may need to earn extra money, you may have to get some training, and you may have to offer free services in the area of your passion to make sure that you really love doing it. You will also have to learn how to gain self-discipline to achieve your goals. Enjoy the journey. View the entire process of discovering your passions as an adventure. See challenges as opportunities. The process might help you explore more about yourself and what you want in your life.